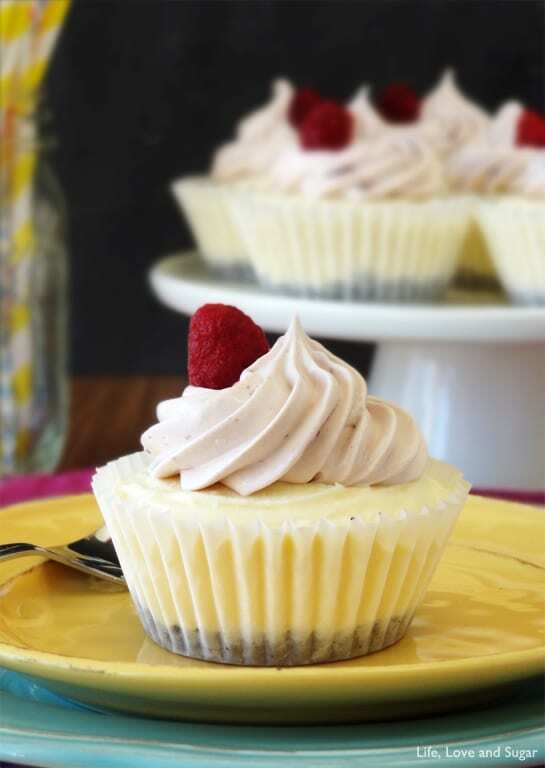 These Raspberry Cheesecake Ice Cream Cupcakes are so creamy and delicious, you’ll want to eat them all. 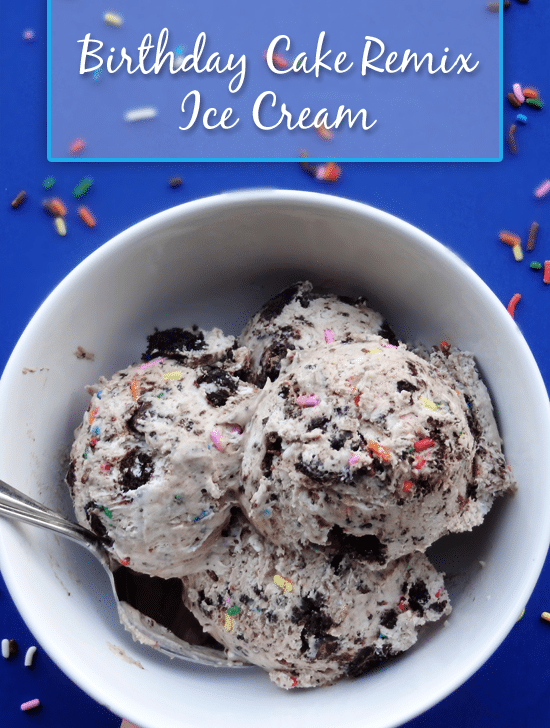 And to make them quick and easy to make, they require no ice cream machine – score! I can’t believe tomorrow is Christmas! Merry Christmas! Happy Holidays! Christmas is my favorite holiday. For me, it’s all about getting to spend time with the family and celebrate the birth of our savior. So far, it’s been a fantastic birthday week, not that I usually celebrate for a week or anything. We went to the Carolina Panthers football game on Sunday and it was an AWESOME game! Such a big win that clinched a spot in the playoffs. Plus, we beat the New Orleans Saints! I don’t know if you watch football or saw the game on TV, but in the third quarter it absolutely poured rain! But with it being such an important game, the fans were fired up and most of them stayed out in the rain and cheered even harder, ourselves included. It was the most excited and loud I’ve seen that crowd in years. It might be the best environment in that stadium since the last time they had a home playoff game. I hope we get another home playoff game in January! For as long as I can remember, we’ve been celebrating my birthday with dinner at home on either Christmas Eve or Christmas. But last night, we went to one of my favorite places to celebrate – The Melting Pot. I think that might become a new tradition. In case you’ve never been, The Melting Pot is a fondue restaurant. We usually do a cheese fondue, the meat fondue and then of course, the chocolate fondue. We introduced my brother to the mushrooms with the green goddess sauce. Every server we’ve ever had has told us that’s their most popular sauce and way that people eat it. Truthfully, I’m not a fan. I don’t like mushrooms. I’m a texture person and the texture of them just grosses me out. But the hubs looks forward to them every time and he showed my brother how it was done. Part way through, my brother said that if he didn’t stop eating the green goddess, he was going to become one (you know, a green goddess?). Maybe you had to be there, but it was pretty funny. It was an awesome meal with great company. It was so fun to watch everyone enjoy the food so much. We got 2 chocolates – the best part. They had a special Snickers chocolate that we got and then since I’m a huge white chocolate and banana fan, we got the bananas foster chocolate. So stinkin’ good. 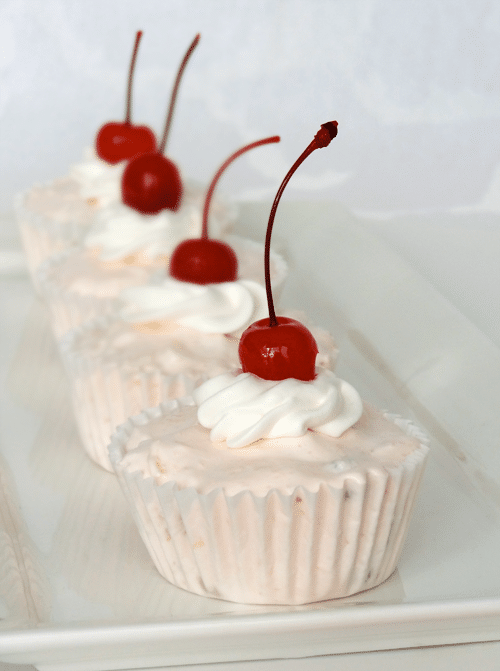 To celebrate my birthday with you on the blog, I decided these Raspberry Cheesecake Ice Cream Cupcakes would be perfect. For the last few years, I’ve had an ice cream cake for my birthday, so a frozen birthday treat seemed perfect! I pretty much love cake in all forms, but I really do love cheesecake. They actually give you a piece to dip in your chocolate at The Melting Pot. 🙂 And raspberry cheesecake is always a winner. These cupcakes start out with my usual base for no-machine ice cream. Cream cheese, sugar, milk and cool whip. It’s surprising how creamy and tasty ice creams made with this base are. You’d never know it wasn’t made the “real” way. 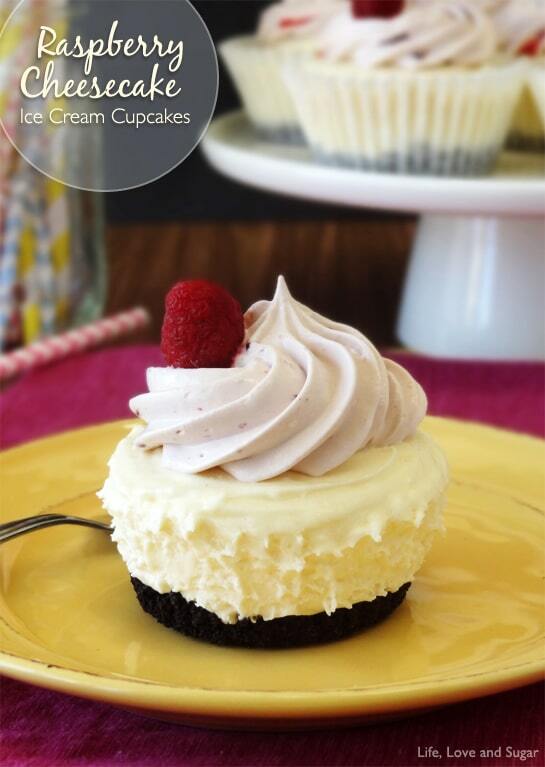 For these particular frozen cupcakes, the cream cheese base is perfect for the cheesecake flavor. 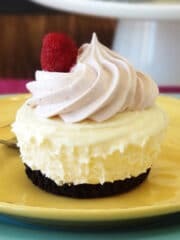 Add to it a cheesecake flavored package of pudding powder you have yourself a delicious cheesecake ice cream base for the cupcake. I put an Oreo crust on them, because every cheesecake should have a crust – and Oreo makes a rockin’ crust. 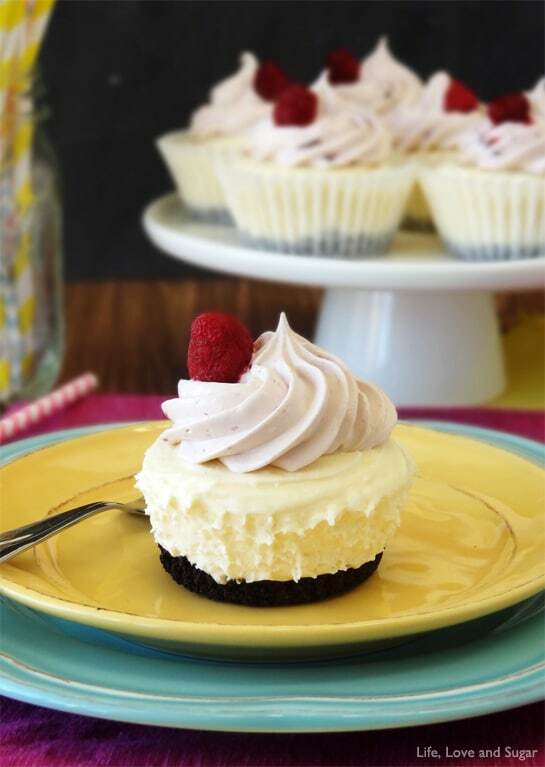 Once you have the ice cream cupcakes frozen, just add some raspberry jam to some additional cool whip and add it to the top. The flavor of these is spot on. They really do taste like raspberry cheesecake in ice cream form. 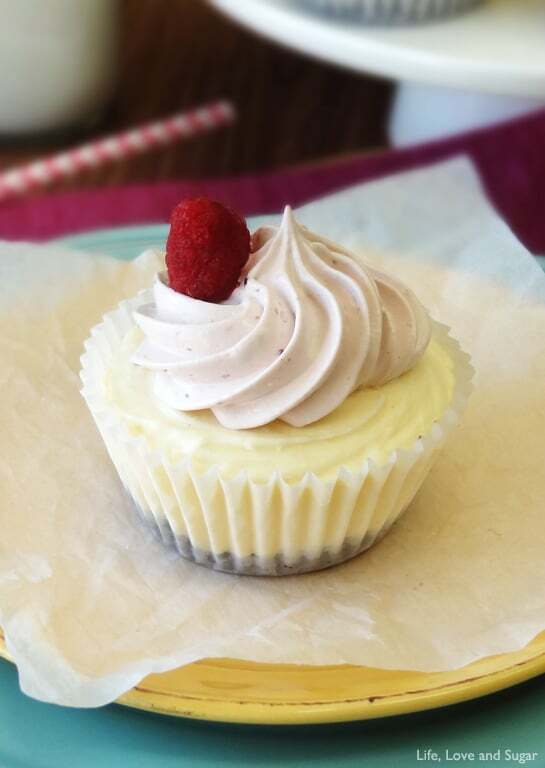 The raspberry whipped cream is just right. 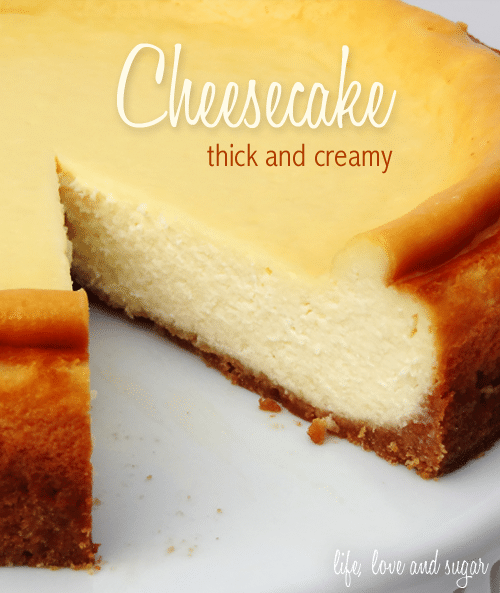 Not too strong a flavor, but enough to compliment the cheesecake. Of course, if you want a stronger flavor for the raspberry, you can easily add more jam. When the hubs had one of these, he declared them to be his new favorite. I wasn’t expecting that at all! Score! 1. Combine Oreo crumbs and melted butter. 2. Place cupcake liners in a cupcake pan and about about 1 tbsp of Oreo mixture to each liner. Pat down to form the crust. 3. Combine cream cheese, milk and sugar in a bowl and mix with a mixer until smooth and creamy. 4. Add the dry cheesecake flavored pudding mix and mix until well combined. Mixture will be thick and sticky. 5. Fold in 8 oz of the cool whip. NOTE: Because the cream cheese mixture is thick and sticky, it might seem to curdle a bit, but keep mixing – it will come together. 6. Add ice cream mixture to cupcake liners and put in freezer. 7. Add the raspberry jam to the remaining 4 oz of Cool Whip and mix until smooth with a spatula. 8. 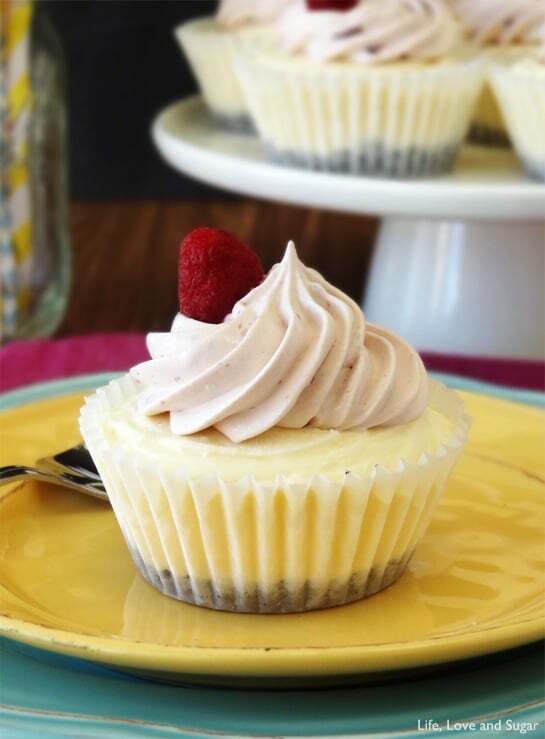 Remove cupcakes from freezer and add raspberry Cool Whip on top. 9. Place cupcakes back in freezer until frozen. This post linked to Inside BruCrew Life, Lamberts Lately, Lil Luna, I Should Be Mopping The Floor, Pint Sized Baker, Kleinworth and Co., Mandy’s Recipe Box, Yummy Healthy Easy, This Gal Cooks, Simply Gloria, Table For Seven, Keeping It Simple Crafts, Crumbs and Chaos, Say Not Sweet Anne, and What’s Cooking Love?. 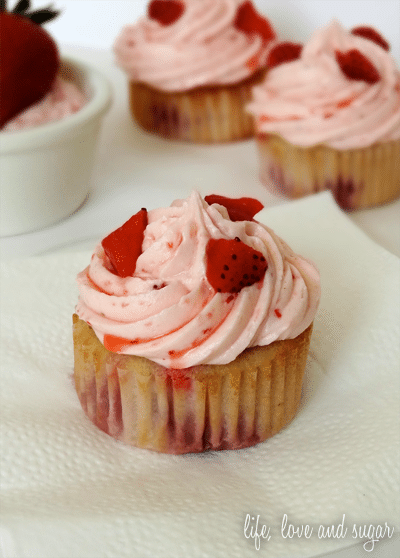 Gorgeous and super delicious looking cupcakes!! 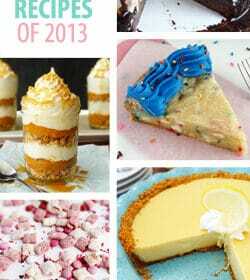 Pingback: Great Ideas - 20 New Year's Party Foods! I hope you had a wonderful birthday and a joyful Christmas, Lindsay! That is a lot of celebrating all-in-one! What fun! These cupcakes are so pretty. 🙂 I will take cheese cake flavor in any dessert. It is my favorite! I even use a teaspoon of the cheesecake pudding mix in my greek yogurt (semi-guilt-free cheesecake)! Thanks for the “no ice cream maker needed” recipe! Happy belated birthday and thanks for sharing these at our Marvelous Monday party! Pinning! Lindsay, these look like a perfect birthday treat! 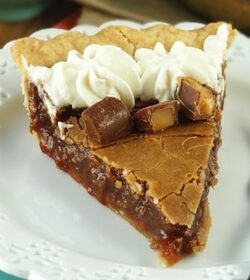 Scrolling down your sidebar I actually found about EVERY single photo to look like a perfect bday treat too. Dessert lover here, guilty as charged. 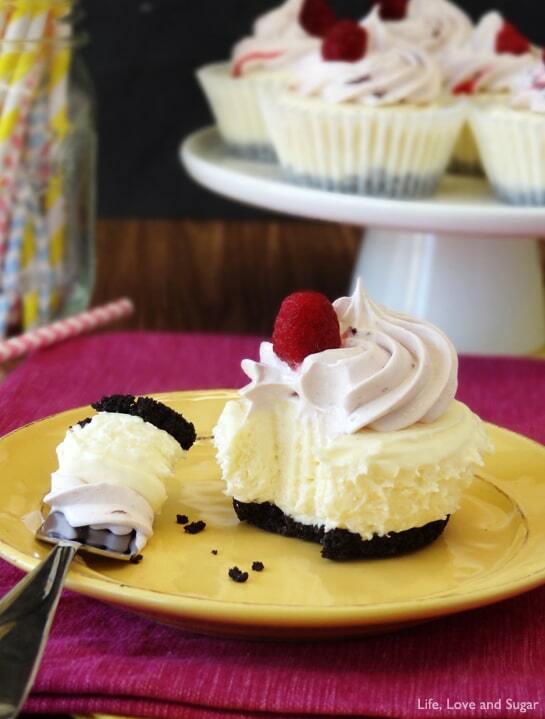 I’m with you on the Oreo crust to these mini cheesecakes too. Who wouldn’t rather have a punch of chocolate alongside the tangy cream cheese, right? YUMMY! Thanks for sharing. Thanks Jelli! I’m a lover of cake and desserts too 🙂 The sweeter the better! ssay that I’ve truly loved browsing your bog posts. hey, I am loving the recipes!! I was just wondering though, other recipes have said to keep the oreo cream on it. With the oreo crumb do we take out the oreo cream? Can’t wait to have a go at this recipe! Hi Jayne! I’m so glad you found my blog as well! 🙂 I leave the filling in the Oreos – I think it helps them hold together better. About how long do these need to freeze for, before you can take them out and frost them? 3-4 hours should be long enough. Hi! Yes, you can! The standard way of doing that would be to take your own photos of the finished product and rewrite the recipe in your own words with a link back to me. Thanks! Hey I was wondering what could be a substitute to the cheesecake flavored pudding because I live in Australia and we don’t have that here as far as I’ve looked. You could just leave the pudding mix out. It mainly adds some cheesecake-like flavor, but by nature they have some of that already with the cream cheese in the mix. Do I have to use cool whip? I do have a hard time using prepared items. Would whipped cream work? This sounds so delicious and I would like to make it. Thank you.